An atretic encephalocele is a small midline lesion of the scalp and underlying tissues that is usually situated in the parietal or occipital regions. Atretic encephaloceles are composed of a fibrovascular stalk, neuroglial elements, and embryonic vessels. They are usually diagnosed during a routine neonatal examination and commonly have a rather innocent appearance. However, they often produce parental anxiety about their nature and prognosis. Surgical treatment of atretic encephaloceles is indicated for diagnosis, esthetics, or relief of pain. 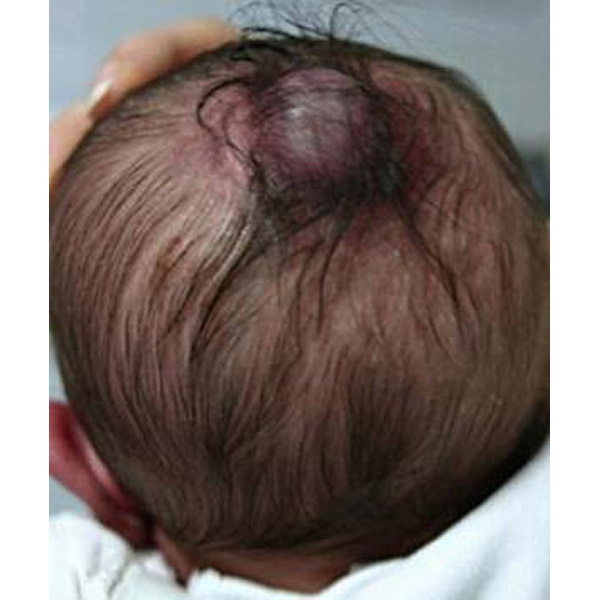 Scalp defect or lesion found on examination of neonate: Atretic encephaloceles are readily detected at the neonatal examination as small midline scalp nodules. MRI helpful: MRI and magnetic resonance venography (MRV) usually confirm the diagnosis of atretic encephalocele.